Blog - What is Ice Wine? - City Vino, Inc.
As the grape harvest winds down in the northern hemisphere and temperatures turn colder, winemakers in cooler climates eye the possibility of making ice wine. Ice wine is a unique style of sweet wine made from grapes that have frozen while still on the vine. Grapes are allowed to stay on the vine several months longer than grapes used to make standard dry wine so they develop an extremely high level of sugar. After the first freeze, the grapes are harvested and pressed while the water in the grapes is still frozen, resulting in a more concentrated juice. Because of the higher level of sugar, the yeast is generally not able to convert all of the sugar to alcohol, resulting in a naturally sweet wine. 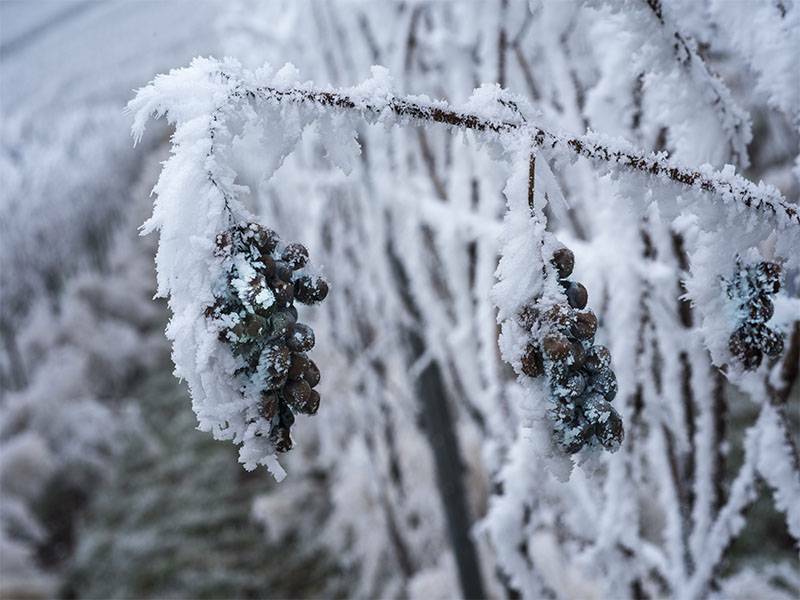 Because of the conditions required to make a true ice wine, they are only produced in the coldest wine growing regions. Germany, Canada and areas around the Finger Lakes in New York are the biggest producing regions for ice wine. The best ice wines are made from grapes that thrive in cold climates and that naturally have high levels of acidity necessary to balance the high levels of sugar. Riesling and Vidal Blanc are the most commonly used varieties. A true ice wine is required to be made from grapes that freeze naturally on the vine. However, those conditions can’t occur in many regions that just aren’t cold enough. There’s also a risk that grapes can rot on the vine before they can freeze. In these cases, grapes are harvested and then frozen. Wines that are produced in this manner may be labeled as “iced” wine or with a fanciful name that contains the word “ice” (i.e Vidal Ice). Because of the process and time needed to produce a true ice wine, they are a bit more expensive but definitely worth trying. Pair these wines with sweet, fruity desserts or pungent blue cheese for the perfect end to a meal.